“OMG”, she exclaimed, “ – and I had expected a handful of elderly people passing some time playing Monopoly!” Instead, the large room was bustling with life. 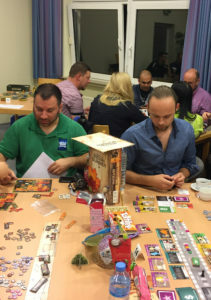 A colourful crew of about 140 people from not only most European countries but also from 5 different continents were busy pushing cubes, meeples and a llama, making trees grow, colonizing planets and conquering galaxies, cultivating wine, solving crimes, hunting down monsters, cheering the Canyon Cup racing pilots, building cardboard roller coasters or commanding knights, orcs or samurai while the moon crashed down on America to release a white dragon god who threatened to forever change the future of the planet. All the while I was smiling and keeping my cool, while inwardly I could not stop myself from picturing Rita Skeeter and her magically animated quill busily scribbling notes, thinking: OMG – what is she going to do next with my babble when I’m done? The nice inquisitive lady from WAZ, the largest regional newspaper, who was interviewing me, had some difficulty grasping the idea of our Dice & Mystics Fringe. No, we’re not a club, neither I nor any other “member” of the Dice & Mystics is a “president” or “chairperson”. Rita Skeeter was baffled. There are no functions, and also no funds. No entrance fees, nothing for sale. Just tea, coffee and biscuits for free. Everything was done, provided for, donated or paid for by private persons who got nothing out of it – just a huge lot of fun. 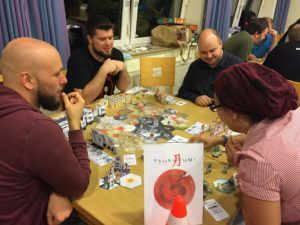 “And you do this – why?” Our love of board games, of course, and because we really like our fellow gamers and the people who work at making games for us to enjoy, and sharing our fun of gaming. There is no nicer place on earth than a room full of happy people playing games. 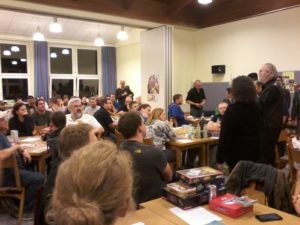 The photographer she had brought was scouting the rooms, spoilt for motives, while I lectured about Spiel Essen, the steadily growing board game phenomenon and the countless numbers of new releases coming out every year, the different games being demoed at our Fringe Event, our guests like The Dice Tower and other reviewers, designers and small publishers and the wonderful international board gaming community. She nodded vigorously. “And nearly everybody is talking English here! I really did not expect such a large and international event. All those ideas and designs! 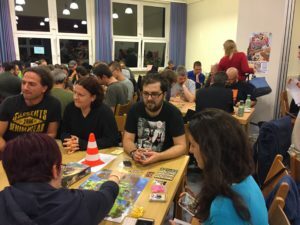 I had no idea board gaming was such a big and universal thing and that there were so very many games. This is a whole new world!” I need not have worried about the scribbling of the quill; when I saw the article later (in print and online), all was hunky dory. The article was, as I should have expected, highly professional and informative, and it shone of her excitement and wonder, too. 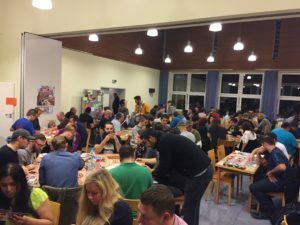 Shortly after that, when the Spiel Essen had just closed, the remaining group of our eagerly expected guests from the Atlantic Congress Hotel arrived, looking forward to a hopefully nice relaxing and re-creational game night after all the bustle of the fair. 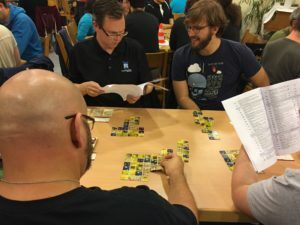 They, like all the other “Meeples”, were greeted individually on entering, given directions towards what to find where and released into the crowd where they dispersed and sat down to play almost immediately. “Why are you calling us ‘meeples’?” our two “Big Bad Wolves” at the entrance were sometimes asked. Why, because we do like to play with you, of course! 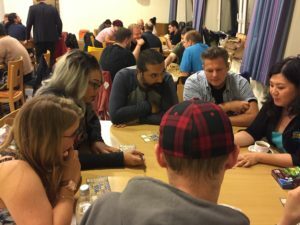 We aimed at giving everybody a nice game night to remember, for free. If we are to believe them and so many of our other guests, we managed to provide that, no more, but no less. Games were played everywhere; the air was buzzing and humming with voices in a way that was creating a pleasant and beautiful background noise. 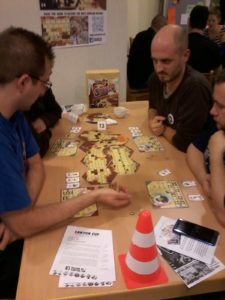 No way could we have pulled this off without the enthusiasm of our Dice & Mystics, our “Meeple Shepherds” who were the only ones who did not get to play much or even not at all. Thank you for your time and commitment. So, how was all of this possible? Through the kindness of many. 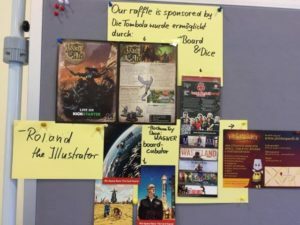 We had been showered with € 5 vouchers for online purchases, got shiny new boxes in all sizes of classic and new games (from the publishers or designers present as well as from some who would have liked to come, too, but could not make it), even plus the brand new expansion as large as the original box, and a set of four minis from the kickstarter “Joan of Arc”, an amazing set of original art, and the Bochum toy shop additionally also bestowed upon us things like fidget spinners, a cute “jewellery” set for toddlers, a teeny weeny plastic bear, a posable (and somewhat overfed looking) toy dog, a pair of yellow wooden dice, Star Wars sticker albums and quite a number of other whimsical items. They have a small but really excellent board game section ranging from Ludo, The Game of Life Rockstar Edition to Zombicide Black Plague or The Others, but they seemed a little uncertain about the nature of our event and apparently thought that where there are games, there must by law of nature also be some children. Thus we had not only prizes, but prizes with a surplus fun factor: The Star Wars album went to a tall black-clad guy, grinning and pointing two fingers at his T-Shirt that had “Star Wars” written right across his chest. Laughs and chuckles. The fat dog was adopted. Applause. Sam Healey won a prize and donated it again, so another ticket was drawn and the prize went to – Zee Garcia, who also donated it again and, twice risen in value, found a third winner under the eyes of cheering masses. Our “Meeple Shepherd” who was herding used dishes back to be cleaned all night had been enticed out of the kitchen by all that laughter, and promptly won the other Star Wars album. Incidentally, she likes Star Wars and loves sticker albums. Some games got signed by their makers on the spot. Many, many of our guests got some form of a token to take back home from our event. 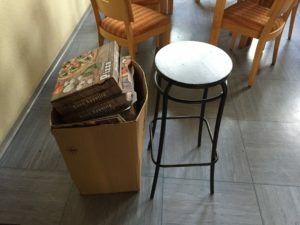 I am also quite sure that – after having been the cause of fun and merriment – by now most of the kids’ prizes will have found their way to a child eventually and the tiny bear has a homely place in a toy chest. And you can check on Youtube where the spinners went… People in the direct neighbourhood who had not heard a sound up to the raffle told us they ran to their windows shortly after 11 o’clock at night to find out where that gigantic laughter came from. 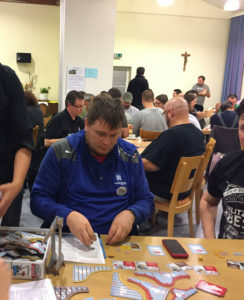 Last but not least we say thank you to the parish of St Engelbert in Bochum-Oberdahlhausen who provided the maybe most important ingredient for our game night: They allowed us to use their entire building of their “parish centre” and all facilities free of charge. Many guests explicitly told us they were impressed by such openness and hospitality. “This is fantastic”, commented Dave Luza; “any town quarter needs a place like this.” Later Sam Healey taught me another more fitting word for “parish centre”: “We call it ‘friendship hall’.” I like that. This is exactly what it was, a place where friendship was given and received. When I checked on my feet – which I had not really been feeling for a while – I suddenly understood why it is called “running” an event. But my, was it worth it! 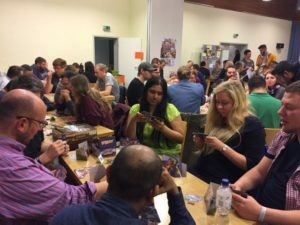 People had fun, and one of our guests even treated himself to a live – if very brief – “dungeon crawl”, or so we heard… (You need to have been there to understand this one.) 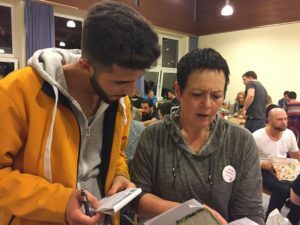 At midnight we could have started to put people on the 2018 guest list on the spot; there was actually a little queue forming of guests ready to leave who wanted to say a few words and shake hands before parting – and make a reservation right away: “We felt at home and among good friends here”. If half of the Meeples who said they will come turn up in 2018, we’re half booked already. 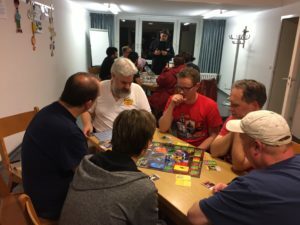 Well, we do need some time, so no reservations now – but it can’t do any harm to check on this website or on Boardgamegeek when the next Spiel Essen is approaching. Until then: Have fun gaming! This entry was posted in Event by Arboretum. Bookmark the permalink.